Published Apr 22, 2014 by Que. Part of the Que Video series. Know all about Arduinos? Well, if not, you will find out the scoop on this cool microcontroller, covering the background of the Arduino project and how to upload a program. Forget hardware, let’s talk about code! 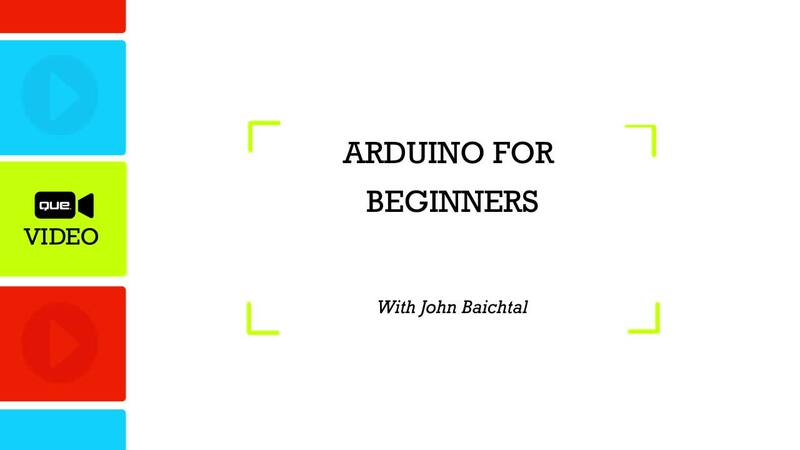 Part 2 explores Arduino programming syntax and guides you through a couple of simple programs. Part Three offers suggestions for expanding your programming skills, including debugging tips and finding example programs online. Add motors to an Arduino and you’ve got yourself a robot. This series shows you how to control four different kinds of motors and actuators, as well as how to use a great motor-control board designed to work with Arduinos. It turns out your Arduino can see, and hear, and feel–it just needs sensors to let it know what’s happening. In Part Five, you'll learn how to connect and program five sensors. Forget about theory! In Part Six you'll create five simple Arduino projects ranging from a digital clock to a LED matrix. It’s a great way to try out new techniques while ending up with something to show off! John Baichtal got his start writing blog posts for Wired's legendary GeekDad blog as well as the DIYer's bible MAKE Magazine. From there he branched out into authoring books about toys, tools, robots, and hobby electronics. He is the co-author of The Cult of Lego (No Starch) and author of Hack This: 24 Incredible Hackerspace Projects from the DIY Movement as well as Basic Robot Building With Lego Mindstorms NXT 2.0 (both from Que). Most recently he wrote Make: Lego and Arduino Projects for MAKE, collaborating with Adam Wolf and Matthew Beckler. He lives in Minneapolis, MN, with his wife and three children. · Primarily hobbyists looking to learn how to use the technology. Also appropriate for students or others learning in an educational setting. · Basic understanding of microcontrollers. Forget hardware, let's talk about code! Part II explores Arduino programming syntax and guides your through several simple example programs. Part III shows you how to expand your Arduino programming skills, including debugging tips and finding example programs online. Add motors to an Arduino and you've got yourself a robot! Part IV shows you how to control four different kinds of motors and actuators, as well as how to use a great motor-control board designed to work with Arduinos. Guess what? Your Arduino can see, hear and feel! It just needs sensors to let it know what to do. In Part V you'll learn how to connect and program five sensors. Forget about theory! In Part VI, you'll get the chance to put your new knowledge and skills to work. Create five simple Arduino projects.ranging from a digital clock to a LED matrix. It is a great way to try out new techniques while ending up with something to show off.